Diocletian had St. Sebastian tied to a tree and shot, but the arrows that pierced his strong body failed to kill him. These arrows are still an important symbol of his sainthood. He later died as a result of blunt trauma. Since he was able to endure such incredible punishment, he is often invoked as the patron of athletes. Archers are also known to pray for him in times of need. 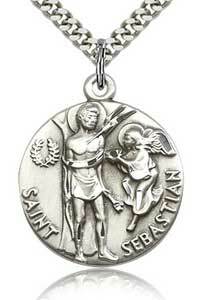 Heralded as the Patron Saint of Athletes, St. Sebastian’s story is one of courage, dedication, and strength. Though little is known about the details of St. Sebastian’s life, the information available shows him to be a man devoted to God to the very end. It took several attempts on his life before St. Sebastian gained the glorious crown of martyrdom in the year 288, in Rome, Italy. The specifics of St. Sebastian’s birth and childhood have been lost through the ages. It is believed that he was born in Gaul (modern-day France) to a wealthy Roman family. He was raised as a Christian in a time when being a Christian was very dangerous. In the year 283, St. Sebastian joined the Roman army. He kept his Christianity a secret so that he would be able to act as a spy in the army. 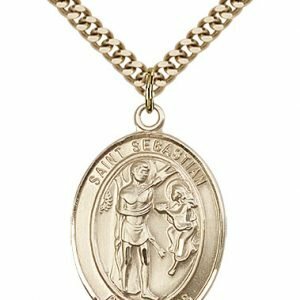 St. Sebastian was promoted to become a guard in the Praetorian Guard, which was a group of men who served as the emperor’s bodyguards. The emperor, Diocletian, hated all Christians and ordered many to be tortured and killed. Diocletian did not know that St. Sebastian was a Christian, which allowed for him to lead this double life, in which he was able to both be a spy in the army and be a faithful follower of Jesus. St. Sebastian’s spying may have resulted in him finding out information that helped to save Christians. He also secretly visited Christians who had been imprisoned for their faith, bringing them supplies and comfort. 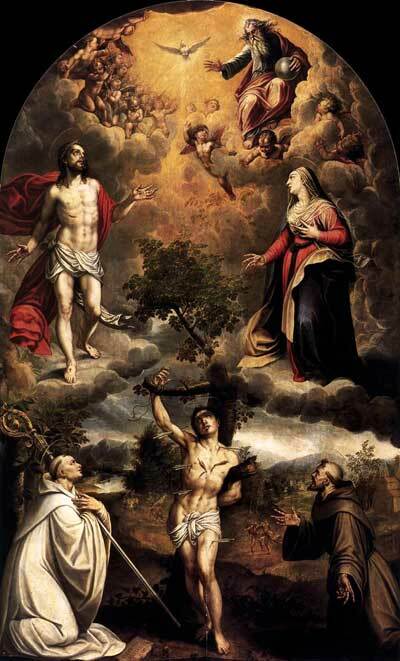 One day, a woman named Zoe was brought to St. Sebastian. She was the wife of a soldier St. Sebastian was in the army with. Zoe had lost her power of speech, and hoped St. Sebastian would be able to help her. He prayed with her and made the Sign of the Cross over her. When she was healed, many learned of what had happened, and became Christians, too. Diocletian heard of Zoe and the other Christians, and had them all arrested. He ordered them to be put to death. 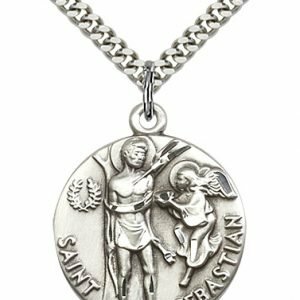 St. Sebastian heard of this, and since he had been close with Diocletian, went before him to try to change his mind, telling Diocletian that he, too, was a Christian. Diocletian would not be persuaded, and instead, ordered that St. Sebastian be killed, too. Because Diocletian was angry that he had been tricked all along by St. Sebastian keeping his Christianity hidden, he ordered that St. Sebastian would be put to death in a terrible way. 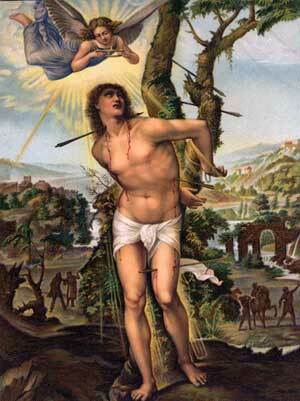 St. Sebastian was stripped of his clothes, tied to a tree, and treated as “target practice” by his fellow soldiers. They shot him with arrow after arrow. When they left, a Christian woman named Irene came to him, untied him, and seeing that he was still alive, nursed him back to health. Once recovered, St. Sebastian went to hide in a passageway so that he could talk to Diocletian secretly. 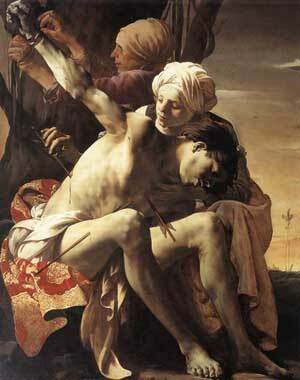 St. Sebastian told Diocletian what he thought of his cruelty, and tried to preach to him about becoming a Christian. Diocletian was surprised to see him alive, but said nothing and left. Diocletian went back to his residence, and told his soldiers to find St. Sebastian and see to it that he died this time. The soldiers beat St. Sebastian with heavy clubs until he was dead. Then they took his body and pushed it into one of the city’s sewers. During the 14th century, the Bubonic Plague, also known as the Black Death, ravaged through Europe, killing an estimated 75 million people. At the time, the people were unaware as to how the disease was transmitted, and felt that catching it was a random occurrence. They likened it to being shot with an arrow, by the army of nature’s archers. 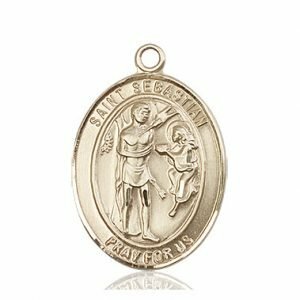 In an attempt to seek help from heaven, they prayed to the saint who was associated with archery for protection and relief from this deadly disease. 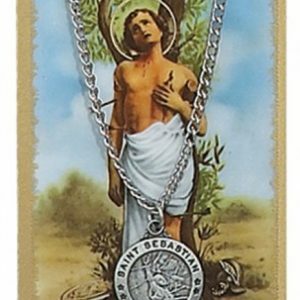 This saint, of course, was St. Sebastian. He became known as one of the “Fourteen Holy Helpers” because of his association with being called upon for assistance during the time of the Plague. St. Sebastian is the patron saint against plague and illness, of archers, athletes, the dying, soldiers, and the Pontifical Swiss Guards. 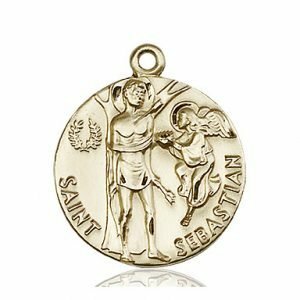 St. Sebastian was a brave man and dedicated soldier, and it is these characteristics that have led to the various patronages associated with him. His courage in the face of death, and willingness to give up his life rather than forsake the God whom he loved and served, shows that he was a devoted, strong, and holy man. Attributes such as these are important for athletes and soldiers, for it is their dedication and fearlessness that helps them to succeed in their endeavors. Most images of St. Sebastian show him as a young man who has been stripped and tied to a tree, with arrows shot into his body. He is often looking to heaven for help and comfort. Occasionally an angel is featured flying near him, bringing him the crown of martyrdom. Let Saint Sebastian be your partner in prayer as you say one of the prayers below or as part of your rosary devotion. Find Saint Sebastian Rosary Beads here. Dear Commander at the Roman Emperor’s court, you chose to be also a soldier of Christ and dared to spread faith in the King of Kings – for which you were condemned to die. Your body, however, proved athletically strong and the executing arrows extremely weak. So another means to kill you was chosen and you gave your life to the Lord. May athletes be always as strong in their faith as their Patron Saint so clearly has been. Amen. 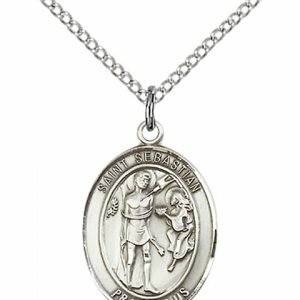 Saint Sebastian, patron saint of athletes and sports, help me to do the best that I can, aim high, and always give it my best effort, and if I should fail, give me the strength to try harder. Amen. O Glorious St Sebastian, faithful follower of Jesus Christ, to you do we raise our hearts and hands to implore your powerful intercession in obtaining from the God the Father all the helps and graces necessary for our spiritual and temporal welfare, particularly the grace of living a holy life, courage to face all perils of my believe and even to sacrifice my life as the cost of my faith and this special favour we now implore………(mention it). O, special guardian from the diseases and accidents, we feel animated with confidence that your intercession on my behalf will be graciously heard before throne of God.